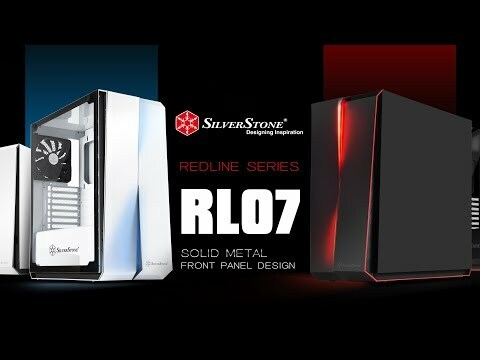 Product Overview SilverStone’s Redline RL07 is a tower chassis with spectacular front panel design mated to a functional and practical internal structure. It has audacious, one of a kind asymmetrical styling that pays homage to earlier aggressive Redline series chassis launched in 2012 but elevates with details often only available on cases costing much more. On the inside, the RL07 has many modern features such as power supply / drive shroud, convenient tool-less drive trays, quick access dust filter and smart backside cable routing design. So it not only has highly flexible space for installing all popular core components, it also has incredible support for a myriad of cooling configurations. There are four total 120 / 140mm fan slots around the case with maximum radiator support of up to 360mm to meet the needs of PC enthusiasts of all levels. Features • Stunning exterior styling with fine lighting details. • Super clean internal look with PSU and drive bay cover. • Quick access filters for easy cleaning. • Smart backside cable routing design. • Motherboard back plate opening for quick CPU cooler assembly. • Supports graphics cards up to 16.3" (415mm). • Full tempered-glass side panel.